Did you know that a tiny custom made valve can prevent diesel engine runaway? Do you know what happens during the process or how to prevent diesel engine runaway? In this article, we will take a close look at Diesel engine runaway and what can be done to prevent this incredibly dangerous condition. As professionals in the diesel repair industry, we know that these incidents may not be as common in recent years, however, we also know that the consequences of diesel engine runaway are as serious as they come. What is Diesel Engine Runaway? Diesel engines are increasingly common and continue to overcome many obstacles. In other words, diesel engines are no longer associated with high maintenance or excessive noise and can now compare or compete with even the most impressive gasoline engines. As you know, diesel engines are also used to power mechanical equipment and vehicles across every industry. Due to an especially durable physique, diesel engines are suited to rugged environments and machines or vehicles that require constant use. Unfortunately, this also translates as an increased safety concern as there is likely to be more people present should an incident take place. With this in mind, there are still certain aspects of a diesel engine that can leave the machinery or vehicle at risk. Diesel engine runaway is the most serious of these risks and the worst nightmare for drivers, operators and the immediate surroundings of a diesel engine. As already mentioned, diesel engine runaway is a serious condition that can result in a diesel engine catching fire and even exploding. As the phrase suggests, this problem occurs when a diesel engine overheats, loses control and runs away with itself. Although the engine is destroyed, this frightening possibility is also a serious threat to the people and surroundings of a diesel-powered machine or vehicle. Exactly What Happens During Diesel Engine Runaway? Diesel engines are often preferred over spark ignition engines for different reasons. Diesel engines are more economical with fuel and can withstand much higher temperatures which enables them to last longer than gas engines. For this reason, diesel can also convert heat into energy rather than expose of this heat through the exhaust, as you will see with a gas engine. Unfortunately for diesel engines, this is precisely where a potential problem can arise. Diesel engines use high temperatures for the ignition process but unlike gasoline engines, they do not use a “butterfly” to restrict the intake of fuel. In other words, there is no mechanism to shut off the engine when the RPM reaches an abnormally high level. Why Does Diesel Engine Runaway Happen? There is no one cause for runaway diesel and faulty fuel links, damaged fuel pipes and even overfilling a crankcase can initiate the process. On the other hand, it does not have to be a specific incident, for wear over time and age are the most common causes of diesel engine runaway. To be more specific, machinery and vehicles that experience constant use are most at risk to diesel engine runaway. Poorly maintained engines are even more likely to experience this condition and as previously advised, the outcome can be fatal. In some cases, the vehicle can catch fire and when it comes to machinery, an operator can become trapped in a sudden inferno or explosion. However, diesel engines have come a long way in recent times. In fact, a runaway diesel was once a common occurence but modern engineering has significantly reduced the number of such incidents. Electronic Control Modules can also use sensors to help prevent runaway diesel but there are always exceptions and parts can sometimes fail. How to Prevent Diesel Engine Runaway? In short, regular maintenance can extend the lifespan of a diesel engine but modification is really the only reliable solution when it comes to preventing diesel engine runaway from happening. You see, diesel is heavier than gasoline and has a much higher boiling point than water. Therefore, in order to prevent diesel engine runaway, a system is needed to shut down the air supply in the event of the engine reaching especially high levels of RPM. 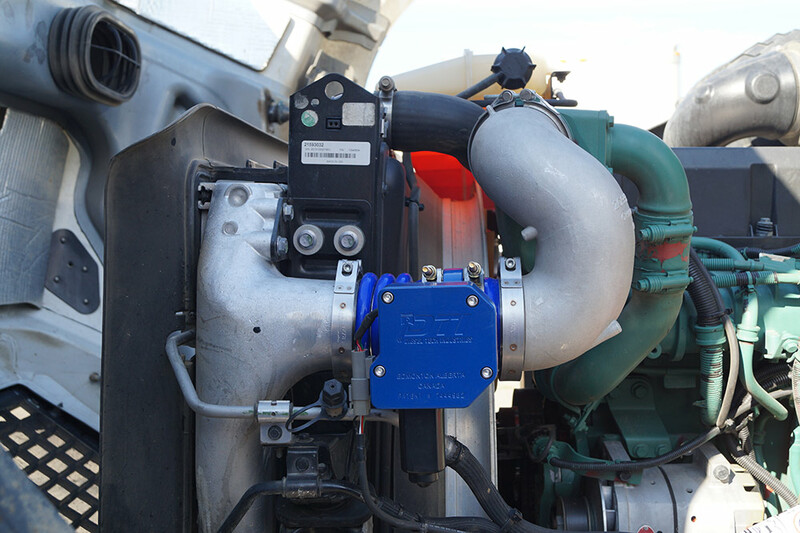 As a leader in the diesel repair industry, Diesel Tech Industries has developed a system that can safely monitor and prevent diesel engine runaway. The DTI Guardian System is a specially designed shut-off valve that can prevent costly damage to a diesel engine and protect drivers/operators from serious injury or even death. Unlike other shut off valves in the market, we have developed a much superior system that can safely shut off a diesel engine before any damage has taken place. Moral of the story: Diesel engine runaway is a serious risk that every owner should seek to know about and avoid at any cost. That being said, now you know about it, what can you do to prevent it from happening? How to Protect the Environment from Diesel Engine Runaway? Let’s face it; diesel engine runaway is not only a threat to human life but also to the environment. That is to say, this highly dangerous condition is known to be lethal and scientific studies also show that the macro effects are just as damaging. But how exactly is diesel engine runaway impacting the environment? In this article, we will take a closer look at diesel engine runaway and how it poses some very serious threats to both people and the environment. As we previously outlined, diesel engine runaway is caused when the engine of a vehicle or mechanical equipment malfunctions and loses control. As for the cause, this can be due to faulty fuel pipes or damaged links but there is really no single cause for the condition. As you might expect, the implications of this condition are especially severe in a work environment. After all, there are usually more people present and more destructible objects to catch fire or even explode. As for the overall environment, the burning of these fuels cause pollution to the air and when diesel engine runaway occurs, the extent of these fumes is immense in comparison. In fact, a recent disaster in Texas can tell us everything we need to know about these dangers. You see, the stakes are high with diesel engine runaway but then higher again when it comes to gas and oil drilling or industries where hydrocarbon emissions are highly flammable. Here’s a short case study on a recent disaster which serves as a reminder that changes are needed to protect the environment and the people who make it their home. Some years ago in Texas, an explosion in an oil refinery left 15 workers dead and more than 180 injured. As you might expect, this blast destroyed the refinery itself and although tragic, the casualties could have been far more severe. It happened on the grounds of the BP refinery, where the oil giant was producing several hundred barrels of oil every day. During one particular refinery turnaround, some large machinery (an isomerization unit) was restarted after lying idle for two weeks and an unusual amount of pressure began to build up inside the unit. Shortly after, three relief valves opened and allowed so much fuel inside the fuel drum that it was far beyond its normal capacity. In the end, liquid vapour shot up into the air and alarms sounded as it created an immense cloud. However, it was too late to shut down the machinery and when an unidentified spark made contact with the gas, an explosion ensued. Needless to say, the average vehicle is not surrounded by so many air-borne hydrocarbons but the truth is, the consequences are still the very same for people in the vicinity. Afterward, it was confirmed that the explosion happened because nearby workers were unable to shut down a truck’s diesel engine. In other words, diesel engine runaway was the cause of this awful tragedy. Although maintenance is good for any engine, modification is the only way to prevent diesel engine runaway. That is to say, the only pragmatic way to protect the environment from this condition is to install a small contraption known as a “shut off valve”. Simply put, this shut off valve closes the air supply in the event of an engine reaching unusually high levels of RPM. Unfortunately, this valve could have prevented the above scenario and saved many people/places from similar accidents. That being said, Diesel Tech Industries is determined to protect their customers and the environment by educating individuals and businesses about these dangers. With the use of the shut off valve, they can also help prevent future disasters and in turn, protect the environment in the process. Unfortunately for many people and businesses, they end up learning about the consequences of diesel engine runaway in the worst possible way. That is, we often ignore the warnings around diesel engine runaway until a worst-case scenario presents itself. The truth is, diesel engines are reliable and have a reputation for performance over long distances and extended periods of time. But show us a man-made creation, and we will show you the possibility of failure and in the case of diesel engine runaway, this failure is a recipe for disaster. Engineering is a very complex and exciting industry that tends to attract especially creative minds. After all, it is often here that innovation can prosper and the highest level of creativity or knowledge can be put to good use. As if that’s not enough, engineering is also a highly meaningful profession. Think about it: as the world continues to evolve at a frightening pace, engineers are usually tasked with creating solutions, designs and many of the most impressive machinery that we see today. As already mentioned, these products and services are also especially meaningful in the sense that they usually end up instilling better health, convenience or happiness in the lives of the people who use them. You can find a wide range of avenues to explore for engineers too, for many disciplines fall under the one umbrella, from civil and electrical to mechanical chemical engineering; the sector has a place for those who like to create, design, build or even just tinker. Simply put, we need engineering to bring ideas into reality and what’s more, in such a technologically driven world, there has never been more demand or importance for the engineer. At Diesel Tech Industries, we like to primarily focus on diesel engines. As you may know, these engines are robust and renowned for their high performance. However, sometimes even the best diesel engines can have problems and when this happens, analysis, ideas and solutions are always required to fix these issues. Needless to say, this is never a one-man-job. The truth is, engineering requires sound problem-solving skills and effective communication between every member of the team in order to be successful. And while we talk about the importance of engineers today, it must be said that the future is just important. That is to say, as a leading engineering company, we fully understand that every member of the team is important and this is equally true about the apprentice, or younger engineers who need training. It’s true, work-integrated training is the best way for younger engineers to learn and the best companies give these individuals the attention they deserve. After all, what we teach today, will be the service that we can continue providing to the engineering industry in the future. But what else does the engineering industry need to be mindful about? When it comes to engineering, the stakes are always high. Whether this refers to safety, getting the design right or executing a process; the consequences are serious. With this in mind, the importance of quality assurance and professionalism within the industry is crucial. Engineering is a process that applies scientific solutions to practical applications but engineers also need to be practical in their way of thinking. For example, it is also the responsibility of engineers to pay attention to the environment. After all, the process often requires that engineers take from this environment in some way and, there needs to be a way to either “give back” or help sustain these resources at the very least. Therefore, it is also the engineer’s responsibility to protect the environment and the people who use the same space. Suffice to say, safety is critical when it comes to the engineering industry. As a rule, safety in engineering is all about designing a workplace that is less likely to have accidents. In this sense, there are always many guidelines within a company for almost every aspect of daily life in the workplace. For example, specific rules are set for how workers might interface with machinery while certain elements are often enclosed or even removed for being hazardous. Safer tools might be selected or walkways cleared to allow for better access but overall, the objective is to prevent any potential accidents. Nevertheless, there is also the possibility of both human error and machine failure, which is why there is always a requirement for more than just rules and guidelines. An example of this can be seen with “shut off valves” which are installed on machinery or vehicles to prevent diesel engine runaway. Moral of the story: preventing problems from arising is the first step of instilling safety in any work environment. Are you familiar with Engineering Industry 4.0? You might have heard about Engineering Industry 4.0? Although an increasingly popular means of organization, it is still not practiced as much as it should. That is to say, this is the right way to go about engineering but unfortunately, many companies lack the discipline to implement this strategy. But what is Engineering Industry 4.0 exactly? Well, this happens when all the constituencies inside and outside the company come together. In every instance, the information collected from these constituencies is combined and then used to create the necessary solution. That being said, the most important aspect of the process is having the right format. In other words, Engineering 4.0 is not just about collecting this information but also formatting this information in a centralized location that is both secure and up to date. And How About Iterative Design? What’s the best way to build a concept? It’s true, – the question is too broad. You see, when you try to pull too many parts together at the same time, the complexity of the system is too big. After all, too many things can go wrong and the potential problems during this process can make it impossible to identify the issue. For this reason, it’s always a better idea to create each piece individually before putting them together. Now: every last piece in this process needs to be designed to perfection and so the cost of this approach is extremely high. It means that iterative design is a preferred method in engineering that makes sense. In case you might not know, Iterative design builds the initial concept or ideal and then goes about expanding and scaling this design. For example, imagine if a company wanted to build a large piece of machinery but was unsure of the complexity of the overall task. Instead of waiting to perfect the overall design, they might break up the construction of this machinery into smaller parts. That way, the company can focus on perfecting a smaller version of the machinery before building on top of the original machine. Needless to say, this is merely an example and iterative design is used across many fields in engineering. While many companies compete in the engineering space, there are just as many who fail to transition and adjust to the changing world of technology. Thankfully, at Diesel Tech Industries, we have managed to stay relevant and keep on top of these changes. In case you might be asking yourself, Diesel Tech Industries is a software/electronic engineering company with a reputation for providing smart solutions across multiple industries. That being said, the main focus of Diesel Tech lies with diesel engines, for the company has managed to master every aspect of the construction and performance of diesel engines. As the engineering workforce evolves, technology is sure to advance but human skills are necessary to ensure the process runs smoothly. In fact, every professional in the engineering industry recognizes this need, which is why safety, training, and willingness to adjust are all essential for the engineering industry of today.